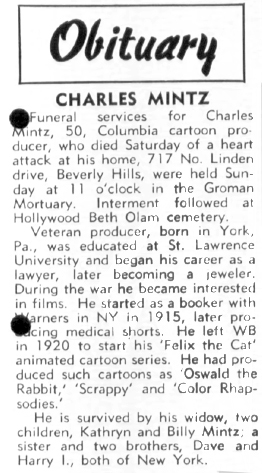 The above obituary for Charles Mintz, producer of the Scrappy cartoons, was published in Daily Variety for Tuesday, January 2nd, 1940. Its reference to Mintz having died on “Saturday” indicates that he passed away on Saturday, December 30th, 1939. That was a surprise to me — I always thought he’d passed in 1940. Both the Etcheverry/Friedwald Animania article and Wikipedia state he left us on January 4th, 1940 — two days after Variety reported his death. If you insist on additional evidence that Mintz died in 1939 — well, here’s his gravestone. In fact, Variety didn’t even mention Winkler by name, though she did get her own obituary — longer than her husband’s — a half-century later when she died. She deserved it: Her career, though brief, was impressive in ways that Charles Mintz’s was not. You don’t have to have a high regard for Charles Mintz’s role in the animation industry to feel a twinge of sadness over how it ended. In 1939, he was in debt to Columbia and was forced to sell his studio to the firm, which terminated him and put his production manager, Jimmy Bronis, in charge, followed by Mintz’s brother-in-law, George Winkler. Not long after Mintz’s ouster, he was dead of a heart attack. And he was only fifty. But here’s a bizarre surprise ending: When Columbia acquired the Mintz studio, it renamed it Screen Gems. It’s used the Screen Gems moniker off and on ever since for a variety of purposes. Columbia’s current owner, Sony, currently releases film under the Screen Gems label, including Resident Evil: Retribution, which debuted earlier this month. That’s right: Charles Mintz’s studio still exists. Or at least that’s the way I prefer to think of it.